One needs to grow in faith every day, nurture it like a mustard seed, which is the beginning of a large tree. We must work every day on the unity of man with God, the unity between us and Jesus Christ, between our people and our God. It then makes a person strong, gives her the keys to freedom. Makes her a winner over evil. 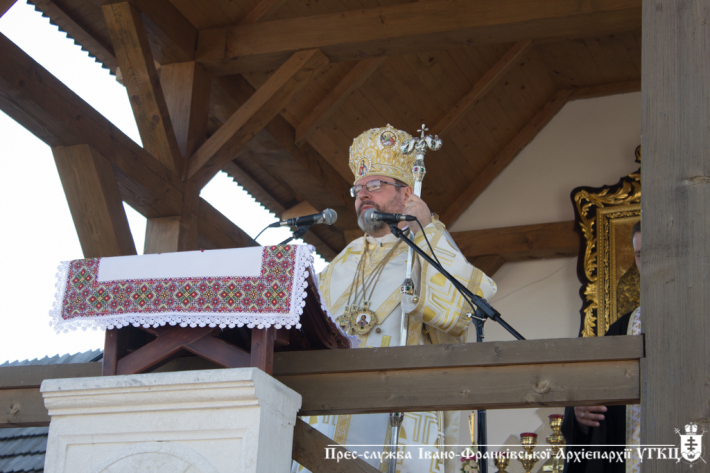 This was stated by the Father and Head of the Ukrainian Greek Catholic Church His Beatitude Sviatoslav during the Hierarchical Divine Liturgy in the village of Krylos, Ivano-Frankivsk Archdiocese, where on August 4-5, 2018, the All-Ukrainian Patriarchal Pilgrimage to the Кrylоs miraculous icon of the Mother of God tооk place. "This pilgrimage is a grateful prayer for the gift of the 1030th anniversary of the Baptism of Rus’-Ukraine," the Primate noted during his sermon to the pilgrims. – “We want to thank the Lord God for the fact that 1030 years ago we came out of the baptismal font, to which we were brought by the Equal-to-the-Apostolic Prince Vоlоdуmуr, as the only united in Christ God's people. This treasure of holy faith was passed on to our people as the most precious national treasure, from generation to generation, from parents to children, from mother to child." "Faith in God," assured the preacher, "means absolute unity between man and God. This sacrament took place in the person of Jesus Christ. Jesus is God who became a man, incarnated into man, took on Himself not only the human body, but also the history of mankind. With its pains and sufferings. Therefore He foretold His crucifixion, death and resurrection." To believе in God, says the Head of the Church, means to unite with God all that we are. It means uniting our soul, our body, our aspirations - our whole being. Such a unity between man and God we call faith. Therefore, the Apostle Paul says: I no longer live, but Christ lives in me. And what Christ Himself did to prove His Divinity can be done through the life, prayer, testimony, and even death and resurrection of a believer. Speaking about the Kyivan Church, the Head of the UGCC noticed that she always, at every historical moment, led her children to be united with Christ. The Church of Kyiv has always served her people, always taught both а prince and а peasant to put Jesus Christ at the center of one’s life. "It is our faith in God, - convinces His Beatitude Sviatoslav, - that gives us the opportunity not to fall into extremes in our personal life choices. It is the Church of Christ which should help the Ukrainian society, like 1030 years ago, to find the cornerstone of its national state-building. It is precisely because our predecessors put God at the center of their political and state activities, that the Church was able to fulfill her ministry." “She taught people to be free. It is this mission that our Lord Jesus Christ entrusts to us. Therefore, thanking us today for the gift of faith, we thank God for the fact that throughout history He was with us." During the Hierarchical Liturgy, the pilgrims, led by their spiritual leader, restored their baptismal vows. Finally, the Primate of the Church recalled that this year we pray "Our Father" and "The Virgin Mary" for the honest election in Ukraine in 2019. And with the pilgrims, he prayed for it. At the end of the Liturgy, Archbishop Vоlоdуmуr (Vijtyshyn), the Metropolitan of Ivano-Frankivsk, presented the Head of the UGCC with a copy of the miraculous icon of the Krylos Mother of God, so that She protected him. 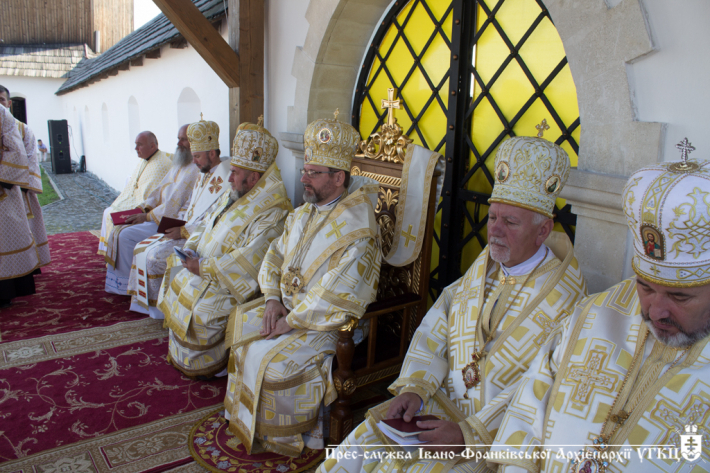 The faithful thanked His Beatitude Sviatoslav with a round of applause for prayer and spiritual guidance.